In the weeks following the start of 2018, volunteers and staff members were hard at work to open the new VOICES Training Center. 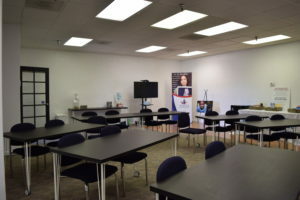 An extension of the VOICES administrative offices in Old Town Scottsdale, the Training Center is home to CASA trainings, recruitment events, volunteer orientations, and everything in between! Meet Rosie Ronnow, Training and Program Coordinator at VOICES. Rosie provides a tour of the Training Center along with what’s coming up on the calendar for 2018. I am thrilled to introduce our new Training Center; not only to our VOICES family, but also to the broader Court Appointed Special Advocate Community. and information is constantly emerging, providing new information about how we can best serve and support the children we are working with. With the VOICES Training Center, our goal is to provide trainings that are relevant, current, useful and interesting to CASA volunteers, equipping them with knowledge that will allow them to be the best advocates possible for the best interest of their CASA children.